We take great pride in ensuring that all our guests enjoy a comfortable and relaxing stay with us in our magnificent hotel based in the Lake District. Attention to detail is the underpinning of all that we do, from the freshly prepared food we serve in our restaurant down to the design of our luxuriously appointed guest bedrooms. 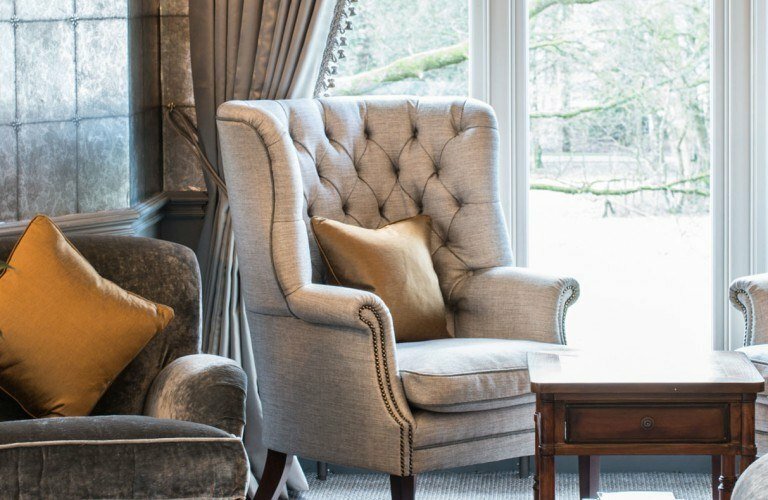 Working with acclaimed interior designer James Mackie we have spent a great deal of time working on the style, colouring and layout in all our rooms, to create luxuriously appointed havens of tranquillity. We have undertaken to use the finest materials available, including fabrics by Zoffany, luxurious Westmorland beds specially created for us by Yorkshire based maker Harrison Spinks, bespoke wall coverings created by Lancashire based company Lincrusta and luxurious Herdwick sheep’s wool carpets created for us by Cumbrian carpet maker Wools of Cumbria Carpets. Where possible we have used local suppliers and manufacturers to create our unique interior schemes. Herdwick sheep (known as the guardians of the fells) and their lambs are an iconic part of this unique landscape, a breed introduced to the fells of the Lake District by the Vikings, who ever since have become part of the makeup of this place. By using Herdwick wool carpets in our hotel interiors we are supporting the Lake District’s upland hill farmers, the local weaving industry and we are building a ready connection for our guests with the fells which surround us at the Forest Side.